Have you tried acai–the berry from the Amazon? It’s the new nutrient that all the health food stores are going crazy over. I like to get the acai fruit shake at my local smoothie shop. It’s a little sweet, but I’m slowly acquiring the taste. Anyway, I hear it’s full of antioxidants and omega-3. And come to find out, it’s now an ingredient in body products. Not surprising, heh. 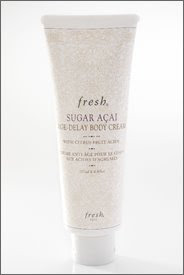 Fresh has such great products and of course has released a new product with the little berry in it. They say it tones and firms the body. I may have to jump on that. Or maybe I should just rub mashed-up acai all over my body. The post Acai Lotion appeared first on Darling Darleen | A Lifestyle Design Blog .